Tuff-Flexä tape provides a smooth non-stick surface and is used on production line runners and guides for easy product and parts conveyance. Also used as an electrical insulation tape for high insulation and high temperature performance. Used as an insulation buffer for RF sealing, and as a surface cover on L Bar, Impulse and Bag sealers. 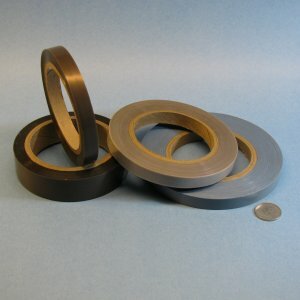 Tape is made by skiving solid PTFE. Available with and without backing media on the adhesive side. Available with either acrylic or silicone adhesive. This tape is highly conformable around splices and connectors. Available in .003, .005, & .010 inch thickness (add thickness of adhesive and backing for total thickness). Standard tape widths are .5, .75, 1, 1.25, 1.5, 2, 2.5, 3 inches. Custom widths are available. We slit the tape from master logs.